It's a busy couple of weeks here in NineteenTeen East, what with winding down the summer and helping assorted offspring launch new ventures for the fall. So to follow up on Regina's bothy boys (and my upcoming posts on the very picturesque Iceland), here is a revisit with The Picturesque Hermit. Both Regina and I will be taking next week off to enjoy the last gasp of summer, and are looking forward to regular posting as September gathers up steam. Look for a new report from Carriage & Driver on the latest model year vehicles, continuing eye candy fashion posts, and more! As our 19th century young lady tourists meandered about the country, guidebooks in hand as they visited scenic vistas and stately homes surrounded by artfully planned “natural” landscapes, they might pause to admire a grotto here, a ruined temple there, an obelisk raised on an artificial hill…or they might stop to check out the resident hermit. Just as the wealthy landowners of the 18th century rebuilt their houses into magnificent country seats, so they hired landscape gardeners to design what was really an outdoor set of “rooms”. All those fake ruins and follies and grottoes and medieval herb gardens and Chinese bridges and sylvan groves and statue gardens were the outdoor equivalent of the libraries, music rooms, dining rooms, drawing rooms, and salons indoors—spaces made to impress, to inspire admiration. The outdoor features, beside being “picturesque”, also carried picturesque meanings: a ruined temple symbolized man’s creations overtaken by the forces of nature, for example. And if a ruined temple or nymph’s grotto was “interesting”, how much more so would be if it contained a resident? But since authentic nymphs were not always easy to find, some wealthy landowners built hermitages—picturesque (of course) dwellings which would be occupied by hermits. And just as ruins had a meaning, so too did hermitages--they symbolized the idea of man's return to nature. 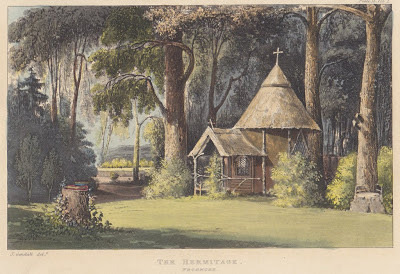 Hermitages ranged from the very rustic--a single room, perhaps made out of wattle and thatch woven into the roots of an overturned tree--to the rather grand--a temple or miniature cathedral (the image above is of the hermitage at Frogmore, from an 1823 issue of Ackermann's Repository). The hermits themselves differed as well. Some were men (sorry, no female hermits--just think of the scandal!) genuinely interested in living a secluded, humble life dedicated to work and prayer…while others were cheerful types willing to appear suitably ragged and “natural” in order to entertain his lordship’s guests out for a stroll in the grounds. Some landowners had very specific ideas on how their hermits should behave, demanding their potential hermits sign contracts stating that they weren't to speak, or to cut their hair or toenails. Others were more relaxed and invited their resident hermits to mingle with guests as a form of rustic entertainment. So what do you think? Is there a spare garden shed in your yard? Why not be 19th century and install a hermit in it?